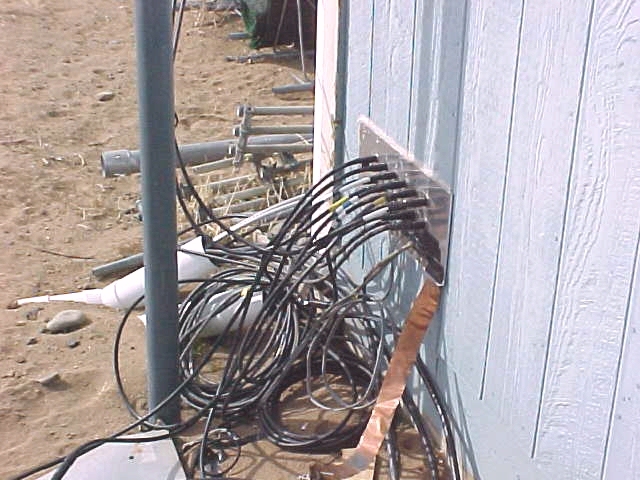 All of this was installed in the Summer 2000 station upgrade. Before that it was a terrible mess, lots of cables stuffed through a little hole in the wall. Now, it's a manageable mess. The cable entrance panel into the shack has 12 SO239 chassis mount feed thru connectors. There are several holes below the coax connectors for rotator and other control cables. These cables are sealed with that "duct seal" putty, found at the home improvement store, that looks like Coax Seal. There is a 2" wide copper strap connecting the panel to the ground system. It's really hard to think about finally cutting that big hole in the wall, but there comes the time when ya just have to do it. Having the pre-fab'd homebrew panel and everything thought through really helped. It took about 30 minutes from drilling the first hole for the jigsaw to a sealed panel in the wall. The hole and panel span one space between the wall studs. Had to do it fast, because the cat's that owned that part of the building thought it was going to be their access to the outside world. Around here they would just be coyote bait, or fast food for the pair of Hawks that have taken over the towers for their personal hunting perch! The feed lines are run from the various locations in the field to the shack entrance panel through 4" rigid pvc drain pipe (~300' of pipe ). All of the pipes have drain holes on ~3' spacing that face down. The trenches are 8"- 12" deep and were all dug by hand. With this sandy soil, that's 4-5 scoops for every one taken out of normal soil, at least it isn't rock busting! Pretty easy, and I didn't mind doing it in two consecutive days, in the cool of the morning and evening, gave me some quality time to think about everything else that was to come and some needed exercise. I spent the trencher rental money on something else, more important to me. Behind the sheds is a ~ 4' high sloping ramp from the graded pad up to the access road around the back of the house which is close to the natural grade. I created this road and doubled the size of the backyard when I moved in, by borrowing a neighbors tractor (also borrowed, sometimes it's better to be lucky than good), and formed the transition with this future problem in mind. This transition made for some quality entertainment installing the trench, pipe and cables. Each conduit has 2- 45 deg elbows to make the transition. All the cables and messenger lines were layed out on the ground in the trench and adjusted for runout at each end. Then the pipe sections were slid over the bundles, one piece at a time, starting at the field ends of the runs. There is a break in the runs just South of the access road behind the sheds, and another one between the towers. The sections of pipe leading in to the top of the ramp were measured and cut to length and installed. Then, the top elbows installed. The sloping pieces of pipe were then measured and cut, and installed. And then the bottom elbows. The cut sections had to be installed and removed a couple of times to get them dialed in, that's why I started out in the field and worked in toward the shack, it was a shorter haul to get them on and off that way. This assembly approach avoided trying to pull the hardlines thru the elbows, which I think would have been impossible. There are two pipes running from the shack to the access opening on the south side of the road behind the storage sheds. #1) Has the cables to the towers, 4 - hardlines, 1 - RG213, 2 - 8 conductor rotator cables, and 3 - 5 conductor control cables. #2) Has 2- RG213 cables for the 4 square and 1 - hardline for the V-3. There is a single pipe running from the road out to the center of the two towers, and single pipes run from that point over to the tower bases. Along the run from the road to the point between the towers, is a Y that branches off to tower #2 for the rotator control cable, the extra 75 ohm feedline, and an extra 5 conductor control cable. Originally, I thought I would do the triband beam switching and phasing from the place in the field between the towers, so the buried cables were routed there, with identical feedlines running up to the beams. Since then, I've decided it is really easier to do it in the shack, where fingers and toes don't fall off, during the winter months. The two beams and the vertical tribander are fed with runs of Andrews LDF4-50A hardline that go to the shack entrance panel. They have a short length of RG213 at each end to make the loop for antenna rotation, and the wall panel connection more manageable. The hardline is simply the result of some very good fortune. The low band antennas are fed with RG213 running to the shack entrance panel. Due to the random lengths of some RG213 cables, there are some sealed cable splices at the access points. All the antennas on the mast, over the shack, have short runs of RG213. The runs from the road junction to the 4 square are made with direct burial RG213, and the control cable for the Comtek box is made with direct burial Romex 3 conductor cable. It has two runs, one to feed the antenna, the other sends the dumped power back to a wattmeter, terminated into a dummy load in the shack. There are extra feedlines hanging out of the conduit ( 1/2" 75 ohm CATV hardline), at the base of Tower #1 and #2, these are sealed off waiting to be put into service on yet to be identified antennas. The hardline run to the V-3 from the road junction is still on top of the ground as it was made after things got too cold to do otherwise. Gotta have a project for next summer. Many of the the lengths of heiliax came with N connectors that were refurbished and reinstalled as the runs were made. The missing connectors were homebrewed using SO239 type barrels and some copper tubing couplers. Pretty easy for me to make and real cheap.